Posted on 11. Jan, 2013 by Mike Fieldhammer. Posted on 04. Jan, 2013 by Mike Fieldhammer. Well, it’s that time of the year. 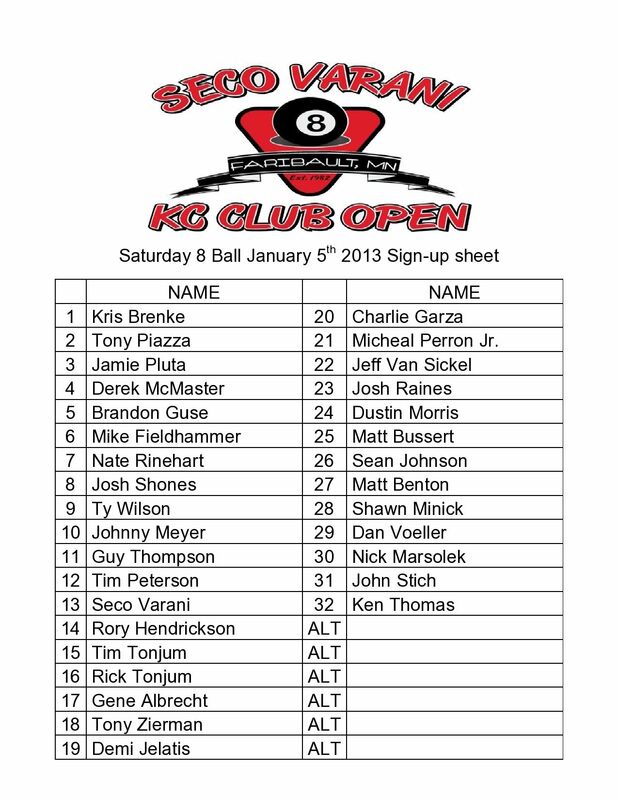 Time for the 32nd annual Seco Varani KC Club Pool Tournament. 32 Players each day. 8-Ball on Saturday and 9-Ball on Sunday. Tournament directors Rich and Bev Arendts keep this event running smoothly and held the locals only event today. Here are the results. 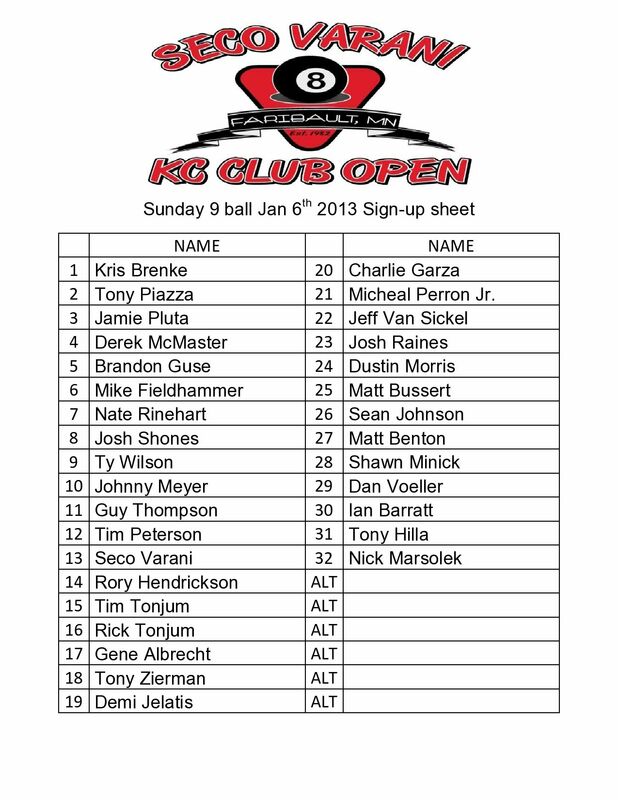 The big player auction for the 8-ball begins at 10:30 (I think) and here’s the list of players. Posted on 18. Nov, 2011 by Mike Fieldhammer. 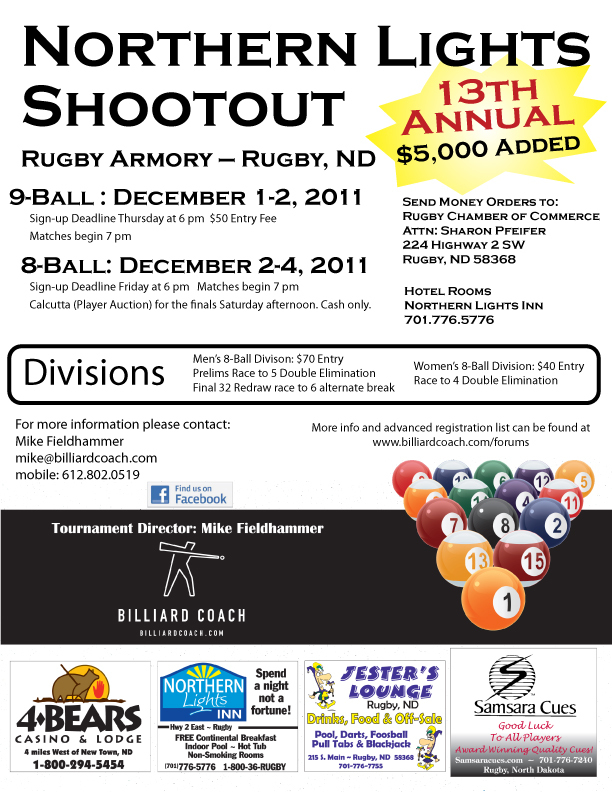 This year is the 13th annual Northern Lights Shootout in Rugby, North Dakota. I’ve been to every one of them save the first. Robert Mattson brought me to my first one in 2000. This December 1-4 the Tournament Director will be yours truly. 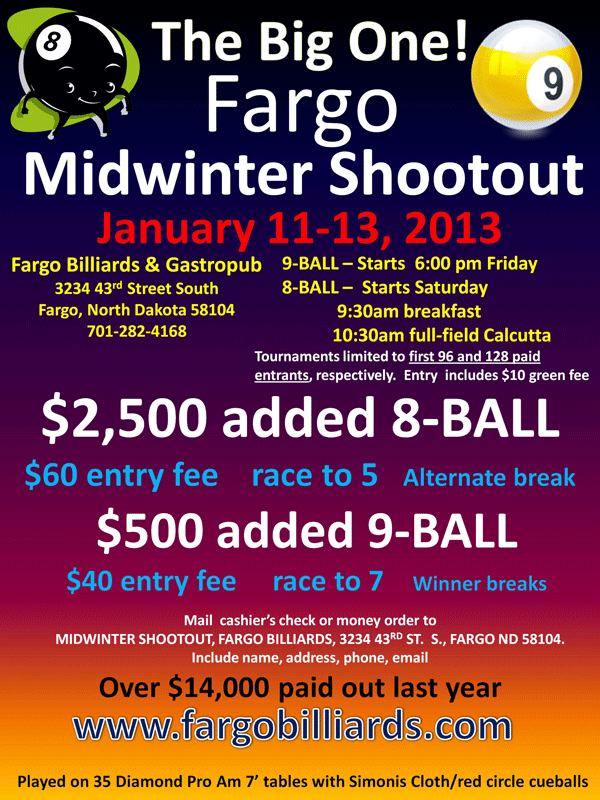 We’ll have a $50 entry 9-Ball warm up tournament that begins Thursday night at 7 pm and continue through the day Friday. There will be no cap on the number of entries in this event this year. We hope to pay out over $1,000 for first place! Not bad for a low entry preliminary event. 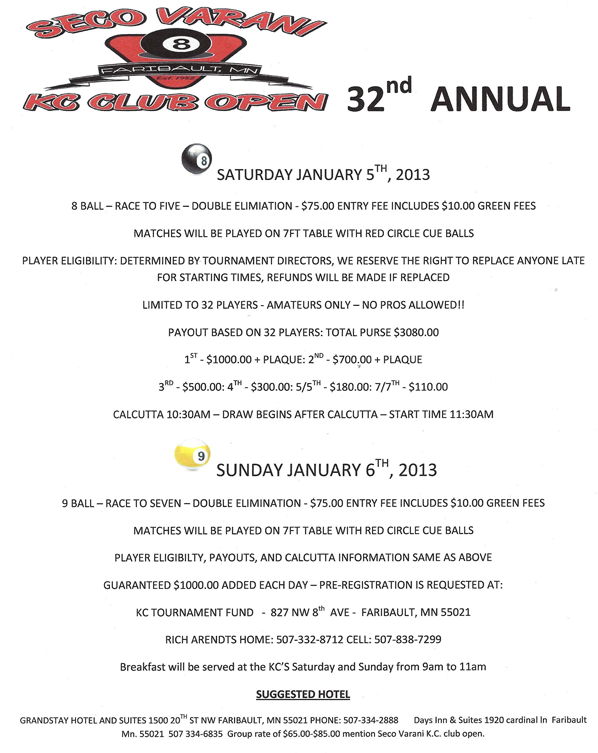 The 8-Ball main event will begin Friday night at 7 p.m. and entries must be paid by 6 p.m. that evening. Mail your entry to the Chamber of Commerce if you’d rather not stress about arriving by 6 o’clock. Weather and oil truck traffic are both unknowns in ND these days. If you absolutely can’t pay by mail and know you’ll be there in time to pay on site, please do me kindness and let me know to expect you. This tournament, the town, and all the great people of Rugby and the players who attend are all very special to me. In particular, I’d like to thank my cue sponsor Samsara Cues. Perhaps one of the most underrated cue makers in the world, they’ve been in business 20 years! 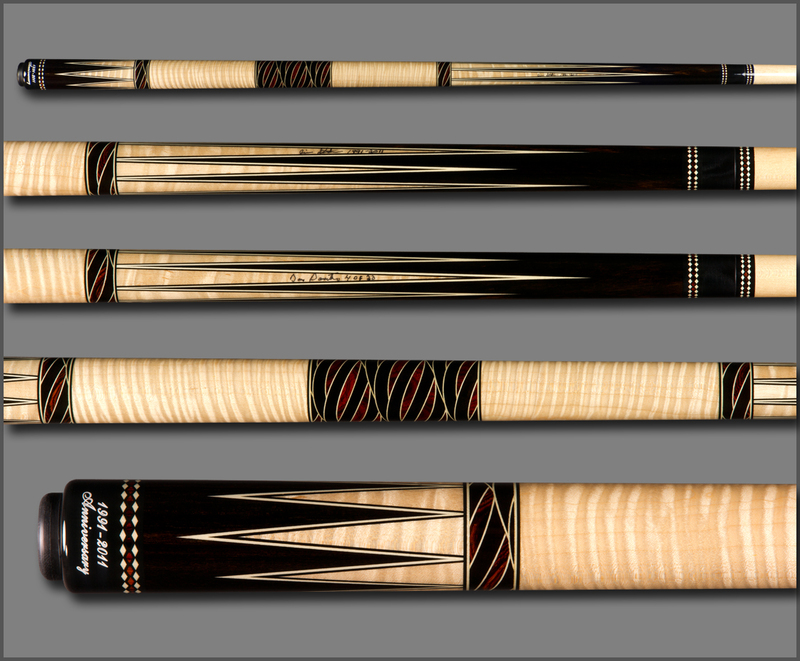 We’ll have some special shop tours and you’ll get to see the guts of cues ranging in price from $500 to $10,000. Why should you come to the Northern Lights Shootout? 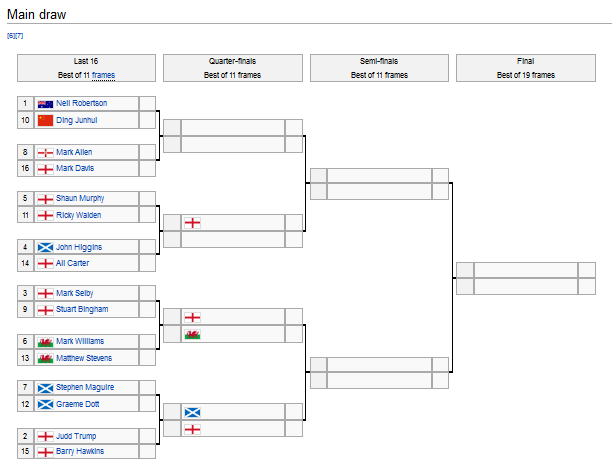 I know pool tournaments have been dieing out and the number of players dwindling, but this event must be kept alive. Please pass the word and make an effort to attend. 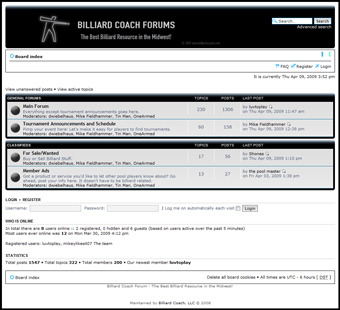 I’ve got a discussion thread in the Billiard Coach Forums that has a list of players that are coming. Add your name to the list and comment on some of your favorite things about this tournament. I’m writing a special piece in this year’s program to thank Mark Hamilton and all the local volunteers for getting this small town event a big time reputation in a dozen years. Here’s to another dozen successful tournaments! Please contact me to register or to answer any questions about the event. Please pass the word on about this great tournament.